Montreal Gazette journalist Marion Scott interviews New Yorker cartoonists Matt Diffee, Anita Kunz and Barry Blitt who were in town for a panel discussion at McGill University and a book signing at the Drawn & Quarterly bookstore. Matt Diffee was looking for a condo in New York. But Manhattan prices being a tad steep on his cartoonist’s income, he ended up buying something a bit farther afield: a tiny, private island in New Brunswick’s Bay of Fundy. It’s the kind of disarmingly screwball tale Diffee is wont to tell, whether recounting his own life or tweaking readers’ funny bones with his pencil cartoons in the New Yorker. Diffee, 42, is in the enviable position of being among the crème de la crème of humorous illustrators whose drawings appear regularly in the august weekly. Which puts him, he explains, in the unenviable position of having most of his work rejected, week in, week out, by editors who deem it not quite up to scratch. “Ninety per cent of our work never gets seen by anyone,” he adds. 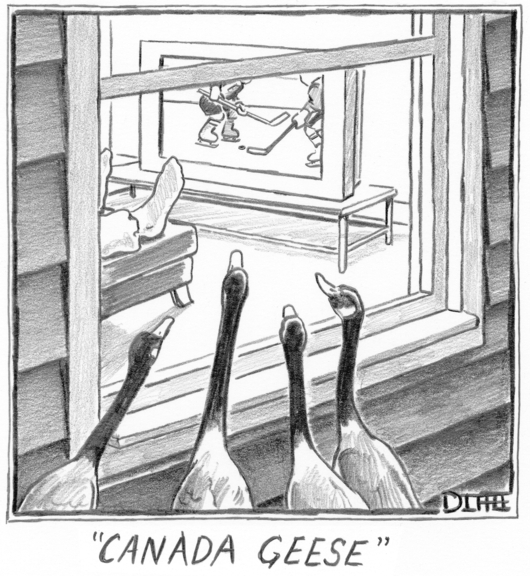 Diffee, who was in town this week to speak at the Association of Canadian Editorial Cartoonists convention, has been creating gag cartoons for the New Yorker for 12 years; he became a contributor after winning a cartooning contest held by the magazine. “Cartoons in the New Yorker are sometimes accused of being too difficult to understand,” Diffee says. In fact, he adds, they generally aim for a sweet spot midway between the too-obvious guffaw and the too-obscure head-scratcher. Ideally, a cartoon should be just challenging enough that it takes a few seconds before the light bulb comes on in the reader’s mind. 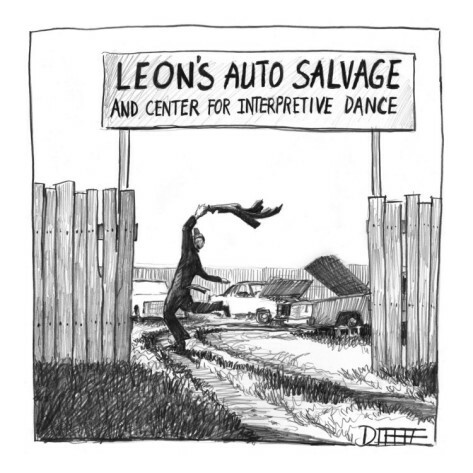 Diffee’s favourite cartoons from his own portfolio include Leon’s Auto Salvage and Center for Interpretive Dance – a sketch of a junkyard with the car-parts dealer executing a balletic leap. It’s just the kind of juxtaposition of high-low American culture that Diffee, raised in God-fearing, gun-toting rural Texas, understands better than most. “I’m kind of an embodiment of that,” says Diffee, who recently moved back to his home state from the Big Apple. 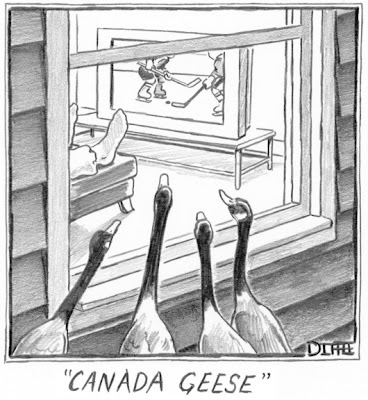 His Canadian experiences inspired a cartoon of Canada geese gathered outside a window to watch a hockey game on television. Toronto-based Anita Kunz produces illustrations for the New Yorker, Time magazine, Rolling Stone, Vanity Fair and the New York Times. Born in 1956, Kunz is the recipient of numerous awards, including the Order of Canada. Q: What do you like best about creating cover illustrations for the New Yorker? A: Well, first of all, I love the magazine itself. I actually read it cover to cover. Plus, it’s one of the only (if not the only) magazines in America that uses illustration for every single cover. The covers really are about capturing a moment in the culture, encapsulating the zeitgeist. Q: How does being Canadian affect your work? A: I think that commenting on American culture as a Canadian is interesting. I’m one step removed. I think that it gives me a bit of distance. Being Canadian of course defines me as a person and as an artist. I never feel more Canadian than I do when I’m in the U.S. I’m not sure how that influences my artistic evolution except to say that I’m fascinated with other cultures and feel like a perennial student of human nature. Q: What is the future of this field? How does the migration of publications to the Internet affect political cartooning and illustration? A: That’s a question that a lot of us are asking. I think print has been extremely affected by this shift. I definitely see less illustration used in print. I also think that many publications are nervous, and less likely to use imagery that might be considered controversial. I’m not sure that we as artists, cartoonists and illustrators have really figured out how to make a proper living on the Internet yet. 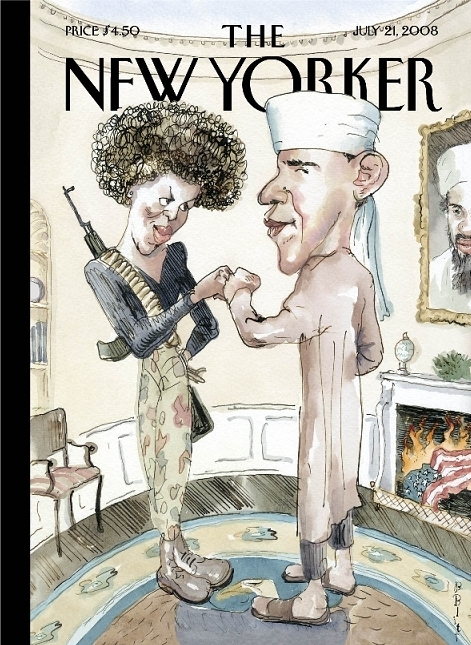 Barry Blitt, one of the United States’ edgiest political cartoonists, is best known for his controversial 2008 New Yorker cover of Barack and Michelle Obama as a Muslim and AK-47-toting radical, fist-bumping in the Oval Office. Blitt, 54, grew up in Côte St. Luc and studied art at Concordia University. 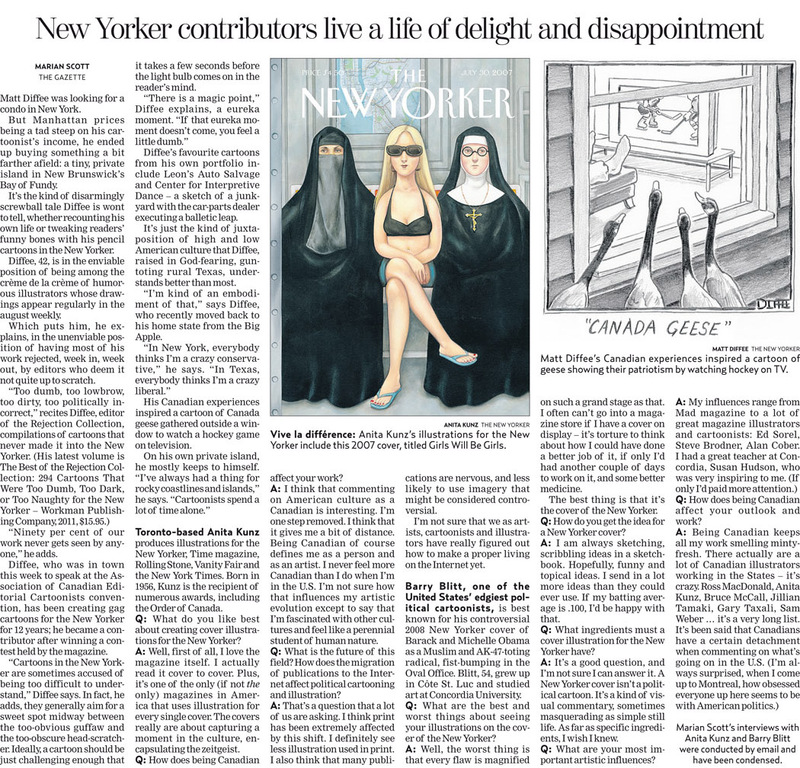 Q: What are the best and worst things about seeing your illustrations on the cover of the New Yorker? A: Well, the worst thing is that every flaw is magnified on such a grand stage as that. I often can’t go into a magazine store if I have a cover on display – it’s torture to think about how I could have done a better job of it, if only I’d had another couple of days to work on it, and some better medicine. The best thing is that it’s the cover of the New Yorker. Q: How do you get the idea for a New Yorker cover? A: I am always sketching, scribbling ideas in a sketchbook. Hopefully, funny and topical ideas. I send in a lot more ideas than they could ever use. If my batting average is .100, I’d be happy with that. Q: What ingredients must a cover illustration for the New Yorker have? A: It’s a good question, and I’m not sure I can answer it. A New Yorker cover isn’t a political cartoon. It’s a kind of visual commentary, sometimes masquerading as simple still life. As far as specific ingredients, I wish I knew. Q: What are your most important artistic influences? Q: How does being Canadian affect your outlook and work? Marian Scott’s interviews with Anita Kunz and Barry Blitt were conducted by email and have been condensed.